Architect’s drawing of proposed multi-use development. Graphic/City of Fayetteville. 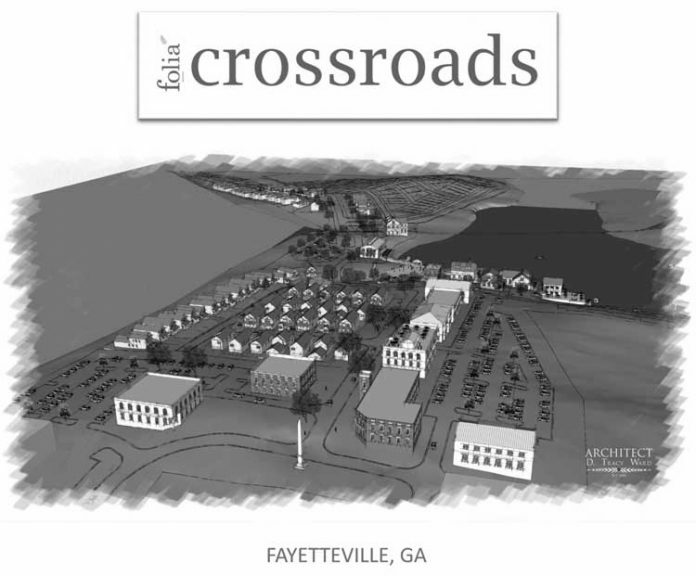 The large Folia Crossroads residential and commercial proposal along Ga. Highway 54 West and South Sandy Creek Road was recommended for approval with conditions at the May 22 meeting of the Fayetteville Planning and Zoning Commission. Above, architect’s drawing of proposed multi-use development. Graphic/City of Fayetteville. Initially proposed as a non-voting work session item in February, the mixed-use development bordering Lake Bennett included 265 detached homes, 100,000 sq. ft. of retail, 50,000 sq. ft. of office space, 20,000 sq. ft. of restaurant space and 20 attached residential units above retail. Total cost of the miniature city is projected at more than $94 million. The recommendation for approval by commissioners followed the same recommendation by city planning staff. The recommendation for approval came with numerous conditions pertaining to transportation, stormwater and water quality and land use. The project will go before the City Council in June. Staff noted that the transportation conditions were a result of collaboration between DRI (development of regional impact) affiliates such as the city, Fayette County, the Atlanta Regional Commission, Georgia Regional Transportation Authority and the Ga. Department of Transportation. Transportation issues to be addressed included items such as a full-access driveway on South Sandy Creek Road, right in/right out driveways on Hwy. 54, pedestrian and bicycle access, improvements to the intersection at Hwy. 54 and South Sandy Creek Road, the addition of a southbound left turn lane on South Sandy Creek Road and the installation of a multi-use path along Hwy. 54 frontage. Staff recommendations on stormwater and water quality included using greenspaces and planting beds as stormwater controls, using pervious materials in applicable parking and storage areas and including rainwater capture for landscape irrigation during dry periods. Staff recommend a minimum of 7,000 sq. ft. per residential lot rather than the minimum 4,000 sq. ft. lots proposed by the developer. Staff also recommended that the retail area include a full-service grocery store, a 24-hour pharmacy and the request that a restaurant, if located adjacent to Lake Bennett, have no outdoor dining. Initially proposed as a non-voting work session item in February, the mixed-use development along Ga. Highway 54 West and South Sandy Creek Road and bordering Lake Bennett included 265 detached homes, 100,000 sq. ft. of retail, 50,000 sq. ft. of office space, 20,000 sq. ft. of restaurant space and 20 attached residential units above retail. The development is proposing 40 percent open space for hiking and walking paths throughout the property and the inclusion of a 3-5-acre urban farm in the residential area. As presented as a February work session topic, the retail and office component of the 145-acre property would be located along Hwy. 54 and would include restaurants, a brewery, commercial space, retail space, a drug store, boutique hotel and theater. The residential component would be situated on the north and west portions of the property and would include 265 detached homes. Homes would range from 1,500 sq. ft. to more than 4,000 sq. ft., with price points from the $300,000s to the low $400,000s. The development was touted as being a combination of New Urbanist and New Ruralism. 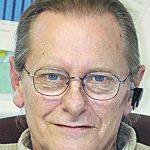 An economic impact report estimated the value of the development at build-out totaling $138,900,000, with the expectation of generating an estimated $1.757 million in annual property taxes. Pertaining to hotel hospitality taxes and theater, restaurant and retail sales taxes, the development is expected to generate an estimated $2.8 million in annual tax revenue. The total capital investment, including development and construction costs, is estimated at $102.48 million. Also contained in the economic impact report were the number of jobs expected to be created. Those include, 250 retail jobs, 200 office jobs, 133 restaurant jobs, 74 theater jobs and 31 hotel jobs, for a total of 688 employment opportunities. The Williams property site was part of 1,200 acres annexed into the city August 2013. The properties prior to the annexation were originally slated to develop as hamlets with a mixture of residential and commercial.